Groundwork is a specialised trade within the construction industry, but it is one that more often than not goes unnoticed to the untrained eye, as much of the work is never seen when a project is completed. However, without the proper groundworks being carried out, a development would be a failure, so this is why it is essential to have an experienced groundwork and Civil Engineering team carry out the work. One Newry based company that has made massive strides in the industry over the past 12 years is Cole Groundwork Contracts Ltd which was established by Conor Cole. Through hard work and the ability to deliver projects to beyond their clients’ expectations, the COLE name has grown with the Groundwork and Civil Engineering sector and not only are they known throughout Northern Ireland and the south, but on the mainland U.K as well. 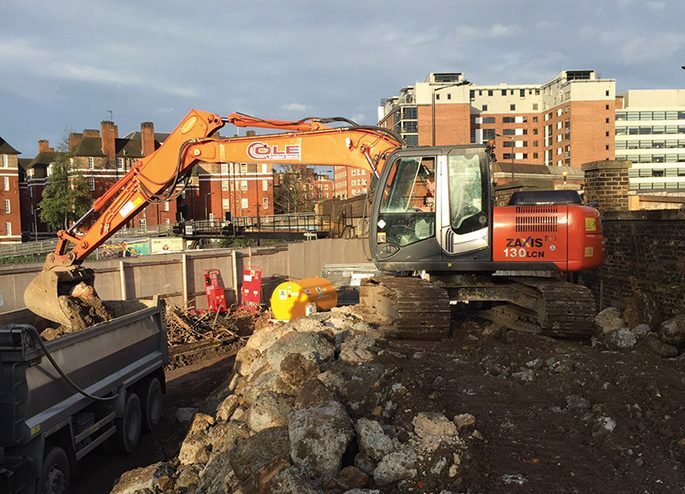 COLE Groundwork Contracts have worked in all sectors of the construction industry on wide range of groundworks, roadworks, demolition and civil engineering projects. They specialise in all aspects of earthworks from bulk excavations to foundations as well as the laying of water mains, pumping stations, all Re-inforced Concrete works, Bridges, sea defence works, Attenuation tanks, Sheet Piling, electrical ducting, sewer and storm drainage, all paving and hard landscape works, and have many awards for their paving design and lay projects. Their focus is to ensure client satisfaction which is achieved by their hands-on management approach which they have developed over the course of many years in the construction industry. The fact that the company have worked with some of the biggest construction firms both here and on the mainland U.K has seen their reputation increase considerably over the last few years. “We have been involved in a wide range of projects both here, down south and in England and Scotland, where the majority of our work is now taking place. The business has really taken off in the mainland U.K and we have a few projects ongoing over there at the moment,” said Conor. Conor admits that the growth of the company would not have been possible without a dedicated, highly skilled, dedicated, and experienced workforce who have played a massive part in the success of the business, and with the help of his Wife Emma looking after all Administration, Health and Safety, and Accounting roles, and along with their young son Harry, they are the backbone and support of Conor fulfilling his goals; his contracts managers for the UK and Ireland which includes his brother Paul Cole, and a long term working friend PJ Fagan, which is now a big part of the Cole family. Another specialised area that the company are involved in is the construction of power generating plants which is done for the SIMEC Group. These stations are where bio fuels are turned into electricity. “We are doing a lot of work for the SIMEC Group in Scotland at the moment. It is something relatively new for us, but it is an area that we are determined to become a leading player in. Continued growth within the company is one of Conor’s main goals for 2018 and by this he means that he is keen to see their profile move from a small business to a medium sized Market leader. “That would be the main aim alright. Hopefully, we can double our turnover, while add to our fleet of the latest and most recent plant there is, and consistently improving training for the whole team. We are always re-investing within the business itself to enable our growth. We are happy with the direction of the business and we feel that the bio fuel generators is an area that we can pursue some more. “The work in the mainland UK is increasing all the time and we would employ many teams over there, while we still have 3 strong teams based in the North, covering North and South. It really has taken off in England and Scotland, and we are keen to push that forward.